Lounge like royalty on this cushy Silver Day Bed. The simple carving and legs make this an ideal space separator without being overly dramatic or a comfy place to curl up with your favorite book in front of a low window. We are engaged in manufacturing & exporting a wide range of wooden day beds. Consisting of top quality durable wooden frame & rope these beds are designed with Indian styles. Comfortable for laying these beds are very good for sun bath. With quality, durability and cost competency these beds are in high demand. We are deal in Outdoor Pool Cabana Beach Furniture Patio Daybed. SECONDMAY provides high quality 100% genuine upholstery leather furniture’s, great combination of wood and leather provides extra comfort with durability and quality with subtle detailing. With detailed knowledge of variegated pros and cons of the market, we have been able to come up with an array of Day Beds. Consisting of top quality durable wooden frame & rope these beds are designed with Indian styles. With quality, durability and cost competency these wooden beds are in high demand. We are offering a wide range of Day Bed - DB001. These are manufactured from qualitative range of raw materials, which is quality checked by our team of experienced professionals. We offer these Day Beds at most competitive prices. 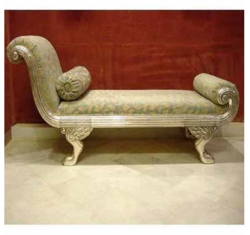 - Day bed with arms made in combination of upholstery, bevelled mirror and High gloss PU paint. - The seat and the legs are separated by a band of mirror with a bevelled pattern. - Combination of High-Resilience-Foam and Memory-Foam to achieve enhanced support and soft comfort. - We specialise in bespoke services. The fabric is to be chosen/provided by the user. We have marked a distinct position in the market by providing a high quality range of Round Shape Day Bed.